Well, who doesn’t love The Importance of Being Earnest? 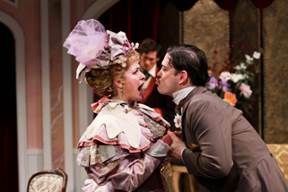 Seattle Shakespeare Company has brought Wilde’s fabulously farcical festival of fop to the stage for a three-week run, and it is a must see. One of the unfortunate dangers about a play as universally adored as Earnest is that if it’s not tight, if the acting isn’t exquisite, if the directing isn’t subtle-handed and brilliant, the results are catastrophic. Seattle Shakespeare, no stranger to working with scripts of no ordinary beauty, has delivered a play that is expertly crafted from start to finish. With such patently monstrous and absurd characters, Earnest is a play that wants absurd actors, and these ones are clearly unafraid of a little absurdity. Quinn Franzen’s Algernon is insufferable—in a good way, of course—while Connor Toms’ Jack is adorable and so very modern. Emily Grogan brings Gwendolen some very fashionable nitwittery, while Hana Lass’s Cecily shines with an obnoxious naivete that is very well on her. The supporting cast is heaven, with Kimberly King bringing a queer kind of sensitivity to the character of Lady Bracknell. It would be easy to get away with casting this play with a grim homogeneity of performances. This cast is not only marvelous, they are novel and creative with a set of very well-known, beloved parts that most have seen portrayed before. I always bite my nails a bit before I see American productions of plays set in England, because a poorly-wrought dialect can soil even the most phenomenal performances. But the voices on stage for Earnest bubble and froth with that delicious old Victorian aristocratic music that makes the works of Wilde and Wodehouse so wonderful. These dialects are natural, elegant, well-understood, and, perhaps more importantly, understandable. Throughout the play, I found my eyes drawn to the visual splendor of both the set and the costumes. Beautifully designed to act both as interior and exterior, with a few small adjustments, Carey Wong’s set is well-suited to the nature of the play: friendly, brightly colored, and a little decadent, as were the Melanie Burgess’s costumes. I confess I fell a little in love with the dress and hat on Emily Grogan (Gwendolen). I imagine that for directors, plays with the kind of constant—it must be said—blithering such as that which Wilde injected into Earnest, present quite a difficult task. How does one maintain action on stage that reflects the bouncy verbosity of the script, without the whole thing turning into chaos? Truth be told, I have no idea. But Victor Pappas did it. The on-stage action is engaging, sensible, and natural. The play flows splendidly. There is nothing not to like about this production, and everything to love.